Hi, Titti and I are back with our second - FLOWERS by ingrid and titti. This time we thought it would be nice to do a table arrangement for New Year's Eve. We both agreed that white flowers would be a nice idea after all the bright colours of Christmas. I found some white Hyacinths and some white tulips at my local flower stall. I then added a few long sprigs of dark green rosemary from my garden - a lovely contrast both in colour and texture. I used two different sizes of vintage apothecary jars and a vintage fish paste jar. 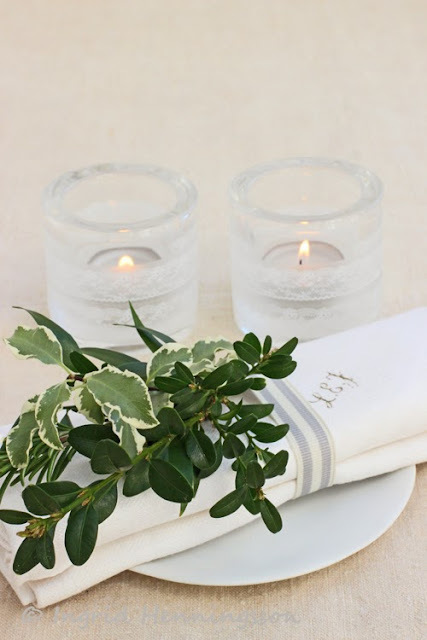 The common denominator is that they are all clear glass - that way you can see the lovely flower stems and they will also reflect the candle light. 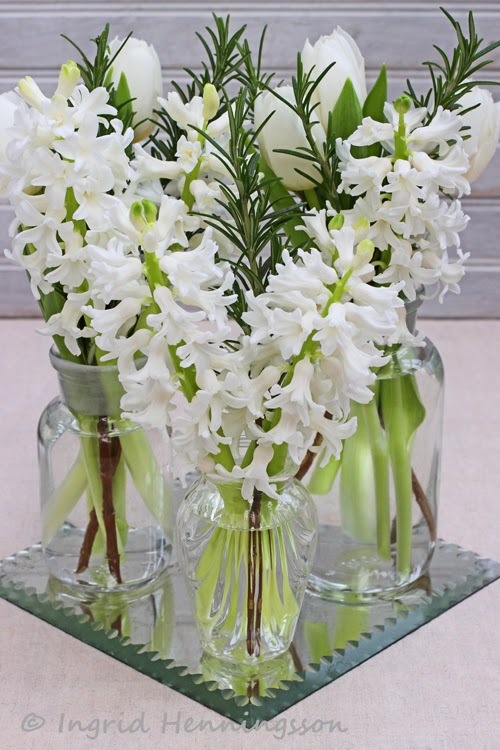 The three vases sit on a vintage table mirror - a clever way of making it look like there are twice as many flowers - as well as obviously reflect even more of the candle light. Titti and I also wanted to add a second little floral arrangement for the table. I did a mini bouquet to add to the napkin ring. 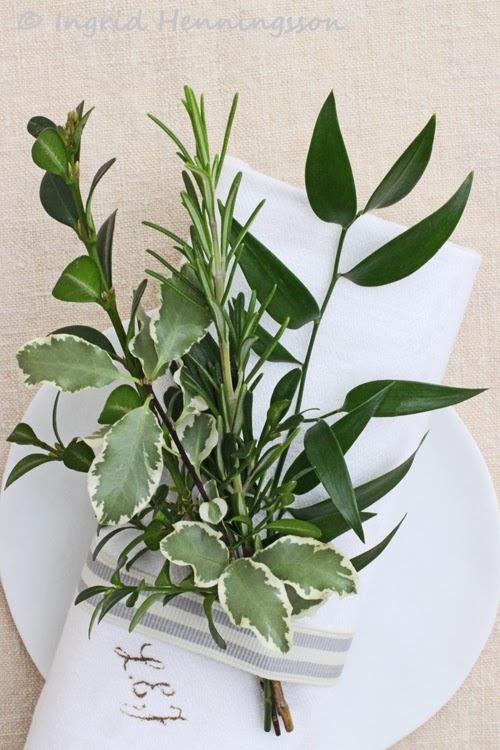 I used only foliage plants for the napkin - Buxus or boxwood that has little dark green leaves, as a contrast I used the light green variegated Pittosporum tenuifolia and for a little bit of scent some rosemary - these are all from my garden. I also added some long leaved also dark green Danae racemosa from the flower stall. I made some napkin rings using a striped ribbon and simply tucked the little bouquet under the ribbon. I have also added a little bit of lace tape around the votive candle holders - the candle light looks very pretty through the white lace. Here is a link to the first FLOWERS by ingrid and titti - that we did before Christmas. Here is a link to Titti's blog - HWIT BLOGG - so you can have a look at what floral creations she has come up with. Eva heter jag! Så vackert arrangemang du gjort,och min kära vän Titti likaså! Ni är otroligt duktiga! Kul med samarbetet ni startat:)Jag har haft blomsterbutik tidigare och kan sakna denna kreativa biten nått otroligt, men får pyssla hemma istället! 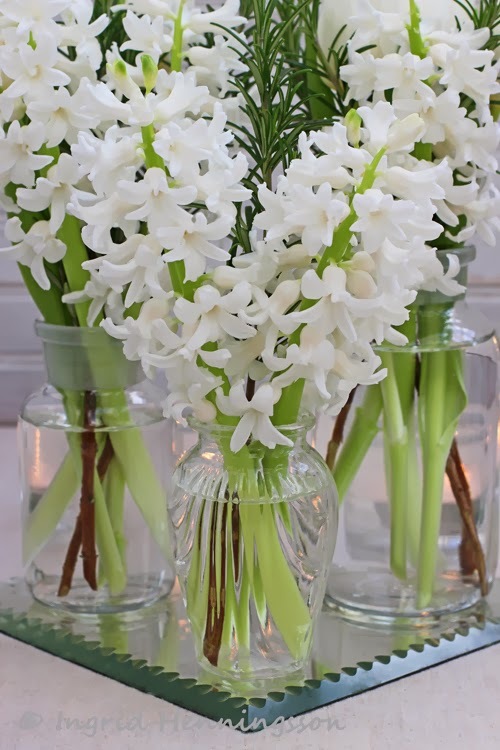 Hi Ingrid, white flowers looks so lovely, the Hyacinths are beautiful!!! Vilken härlig inspiration :)Underbart vackert med vita blommor! I like the rosemary between the beautiful white Hyacinths, so nice to start the new year with fresh white flowers. Wish you a Healthy and Happy New Year! Happy New Year, my friend. xo. For noen fantastiske blomster og en god ide å sette vaser sammen på denne måten. 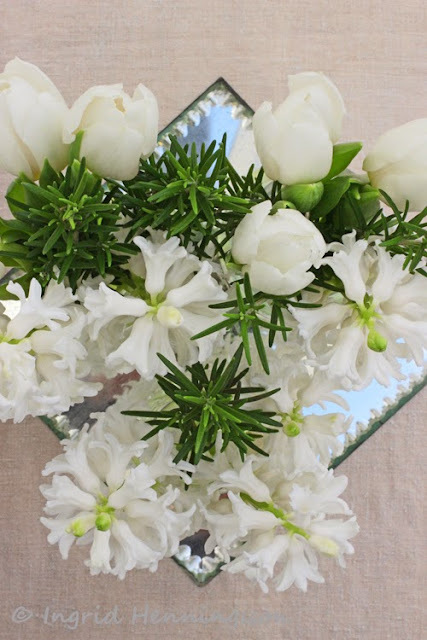 Beautiful flowers Ingrid - I love the fresh white and green combination for New Year. 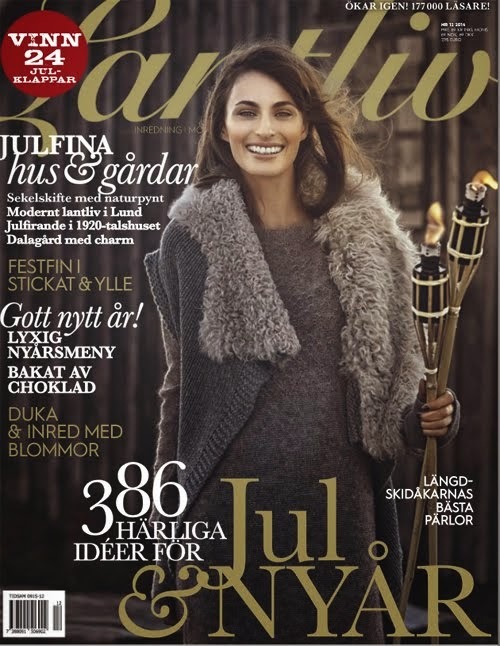 I also love the link you have made with Titti's blog - I am looking forward to seeing what you two come up with in 2014!